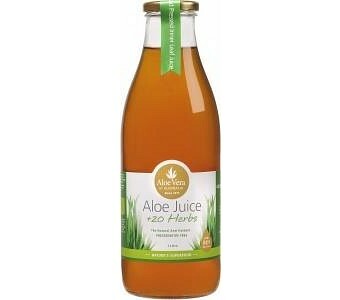 Properly prepared aloe juice is rich in vitamins, amino acids, and trace elements in addition to the aloe plant’s unique mucopolysaccharides – and Aloe Vera of Australia’s offering is very properly prepared, pressed from fresh, organically grown Aloe Barbadensis Miller and bottled without preservatives, sugar or colouring to give you all the goodness of the living leaf. This version also contains 20 different herbs to supply even more nutritional value – including 7 of the 8 essential amino acids; vitamins A, B, C and E; many important minerals; folic and fatty acids; and many more health-giving phyto compounds. To help optimise health and maintain vitality, drink 50mL twice daily. Ingredients: Aloe Vera Barbadensis Miller Extract, Angelica, Broom, Bilberry, Chamomile, Chlorophyll, Dandelion, Echinacea, Fennel, Ginger, Green Barley, Gotu Kolu, Lemon Balm, Licorice Root, Marshmallow Root, Nettle, Olive Leaf Extract, Parsley Leaf, Rose Hip, Slippery Elm, Thyme.